Modest mountains. Deep snow. Short lines. Fast lifts. Impeccably groomed trails. Sound like a dream come true? It’s time to stop dreaming, shift your winter into high gear and plan your incredible Pocono skiing vacation where anyone can find their little slice of heaven. With a history dating back to 1946 when the Pocono Mountains welcomed the first commercial ski area in Pennsylvania and perfected the art of snowmaking, the Poconos have become a bonafide ski destination. Today, the Poconos have it all… whether it be the corduroy groomed beginner slopes or the double black diamonds and terrain parks to test your skills. Get out and experience the exhilaration when your skis start sliding down a Pocono slope. Need ski gear? The Pocono Mountains offers plenty of locations for equipment rental where you can stop at along the way and get geared up to hit the slopes! 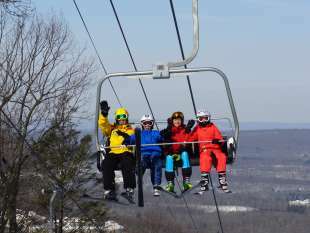 Or rentals are available at our ski resorts in PA; Blue Mountain Ski Resort, Camelback Mountains Resort, Jack Frost Big Boulder, Shawnee Mountain and Ski Big Bear. View daily snow conditions at our 6 Poconos ski resorts. Plan your winter visit with the best ski and snowsport lodging packages and deals.